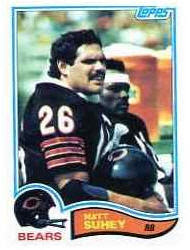 Matt Suhey- You may not know the name but if you were a Chicago Bears fan during the '80's, you most certainly did. A 10-year veteran out of Penn State, Suhey was the prototypical Fullback, a fairly antiquated position in the era of the West Coast and Wildcat offenses. Matthew Jerome Suhey, born July 7, 1958 in Bellefonte, Pennsylvania stood all of 5'11" but at a rock solid 217lbs. That frame opened holes and cleared lanes for the star of the team, Walter Payton. Personal friends on and off the field, Suhey remains close to the family to this day as executor of the Payton estate since Sweetness's unfortunate passing 10 years ago. Payton was always complimentary to his offensive line and his lead blocker, Suhey, often giving them the glory and recognition in interviews and press conferences. Suhey wasn't just a big body, he was a formidable athlete that was equally adapt at running or catching the ball out of the backfield. Many would be defenders found this out the hardway thinking they might relax because it wasn't Payton with the ball. His career stats, while not earthshaking in their own right, tell the story of a man comfortable with his role, making him the consumate team player. Playing in the shadow of Walter Payton was a task Suhey gratefully accepted. It's fitting that his 1982 Topps RC card, depicts him sitting beside Walter. And, despite being positioned in the foreground, your eye is actually more attracted to the unmistakable image of Sweetness in the background. Even here, on his own rookie card, Matt Suhey sits in the shadow of greatness. You can find it on eBay for $1. From someone that saw you play, Matt, I salute you. Matt Suhey was awesome! Actually, Walter was lucky enough to have two good fullbacks leading the way, first Roland Harper, and later Matt Suhey. The Suhey family has a long history at Penn State and I think Matt's Son is playing Tight End for them currently. In my first college FB game I saw Suhey run for about 120 yds for PSU during a Homecoming game. Great card - I am a Vikings Fan but I would still let Walter Payton onto my Rookie Card anytime.